Recently, I lost my mind and decided to hang wallpaper in our dining nook. It wasn’t an easy project, but the end result is so worth the effort! 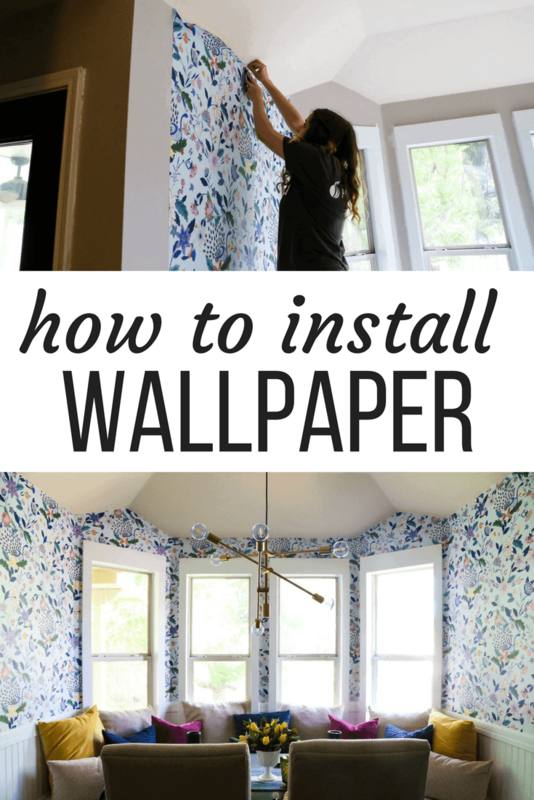 Today, I’m going to show you how to install wallpaper if you want to try it in your own home. Sometimes there are projects that I am just terrified to take on. For example, there was quite a bit of anxiety about tiling our kitchen backsplash. And back when we painted our kitchen counters, I was pretty sure it would be a total disaster. And I’ll never forget the panic I felt the entire time we were renovating our old master bathroom. But, to be honest, I’m not sure any project has ever given me as much anxiety as hanging wallpaper in our dining nook did. I was quite literally shaking when I went to hang up the first piece of wallpaper and my heart didn’t stop pounding until I was at least a third of the way through. Installing wallpaper is a nerve-wracking process. Generally speaking, it’s something that most people think of as an “expert-level” DIY project, and if you mess it up it can look horrifyingly bad. Plus, it’s a giant pain to remove. No pressure or anything, right?! Well, we just wrapped up our dining room renovation and I have officially survived my first experience hanging pre-pasted wallpaper. 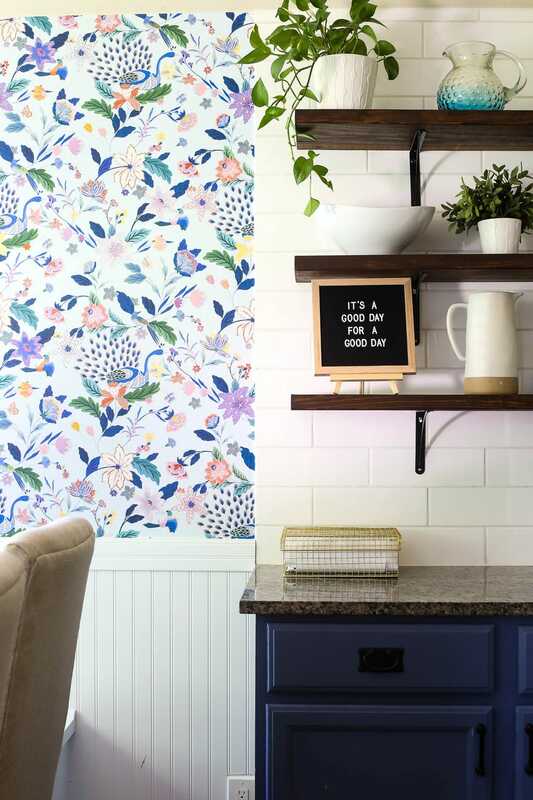 We used the Sylvia Wallpaper from Anthropologie, and I’m just head over heels in love with the finished result. I’ve had a few questions along the way about what the process is like, what we think of this particular wallpaper, and a myriad of other things, so let’s dive in and get all of your questions answered! What tools do I need to install wallpaper? You may also want a wallpaper seam roller, but I found that the smoothing tool got the job done just fine! Oh, and perhaps most importantly – you’ll want a second set of hands on call just in case you need some extra help! I did most of this project by myself, but there were a few times where I absolutely needed Corey’s help. 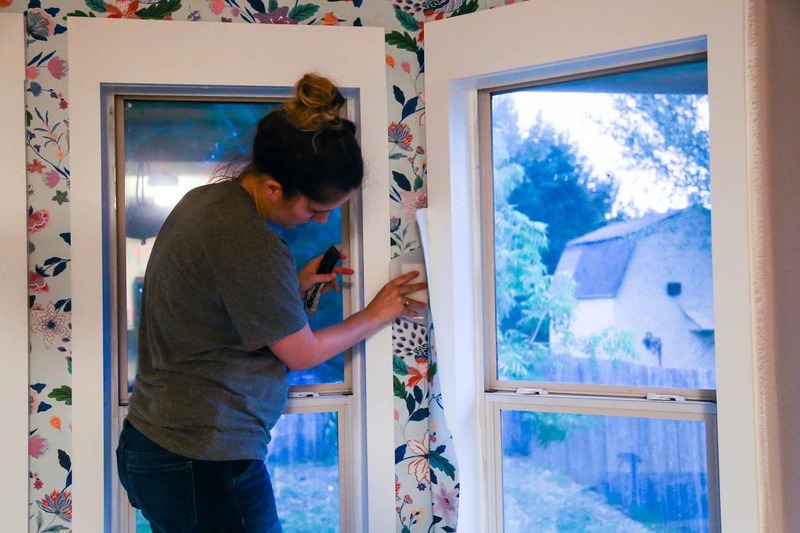 I had a bit of a unique situation hanging wallpaper in our bay window nook – my research told me that this is one of the most challenging places to install wallpaper thanks to all of the windows and corners. So, if you’re installing wallpaper in a plain old room or just on one straight wall, I’m pretty confident that it would be a much simpler project. As a quick reminder, I’m no pro when it comes to installing wallpaper. This was my first time ever hanging wallpaper, but I did tons of research and I’m really proud of how the project turned out despite my newbie status. So, here’s how I got it done. NOTE: These directions are the process I followed to install pre-pasted wallpaper from Anthropologie. 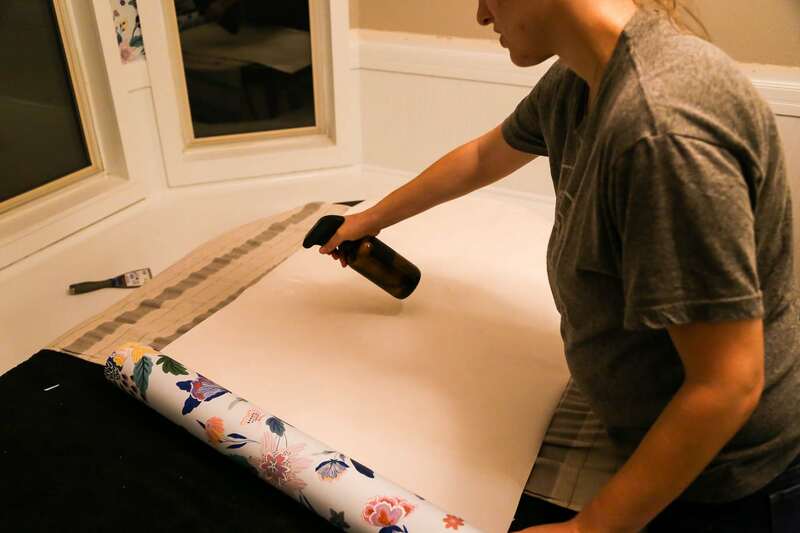 If you’re using a different wallpaper the process may be slightly different – be sure to read the directions that come with your wallpaper to ensure you’re following the correct process. If you’re going to be wallpapering a corner, you want to start there. You don’t want wallpaper to wrap fully around a corner (for example, with half of a length of wallpaper on one side and half on the other), because as the wallpaper dries it can pull away from the corner. So, typically speaking you want to shoot for no more than one inch or so overlapping a corner. Start with the most inconspicuous corner in your room, and measure how wide your roll of wallpaper is. Subtract one inch from that and draw a straight line down your wall (use the level!) at that measurement. Our wallpaper was 27″ long, so I measured 26″ from the corner and drew a line. Measure how long you need the wallpaper to be, then add 4″ – two inches at the top and two at the bottom. 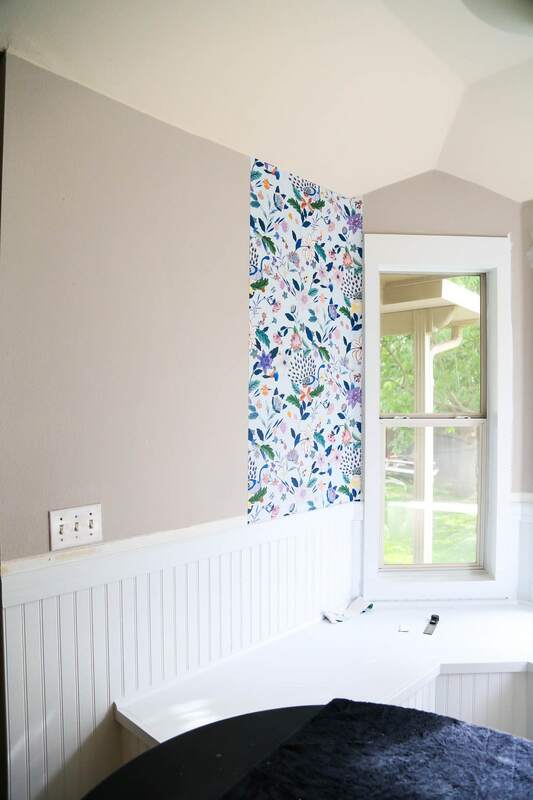 This gives you a little wiggle room with the installation and ensures you don’t accidentally cut it too short and waste a whole bunch of that pricey wallpaper! 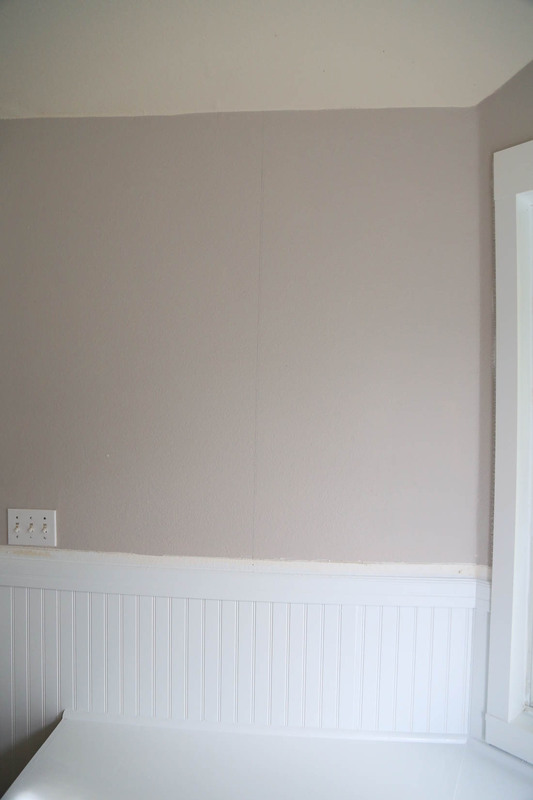 Use your level (to get at least a semi-straight line) and your utility knife to cut the wallpaper. Then, fill your spray bottle with lukewarm water and fully soak the back of the wallpaper using sweeping strokes. Put a little extra focus on the edges of the wallpaper to ensure a really tight seam. Once your wallpaper is fully wet, gently fold each end towards the middle. Do not crease it! This is called “booking” the wallpaper and helps activate the paste. Allow it to sit for 2-3 minutes before installing it. I recommend taking this time to calm your nerves and remind yourself that the world won’t fall apart if your wallpaper installation is a disaster. Once the two minutes or so are up, it’s time to install it! Grab the wallpaper and gently unfold one end (be sure to grab from the top if your wallpaper has a “right side up”! I installed our first piece upside down and had to re-do it). Apply the wallpaper to the wall, gently sliding it into place right up against the line you drew earlier. 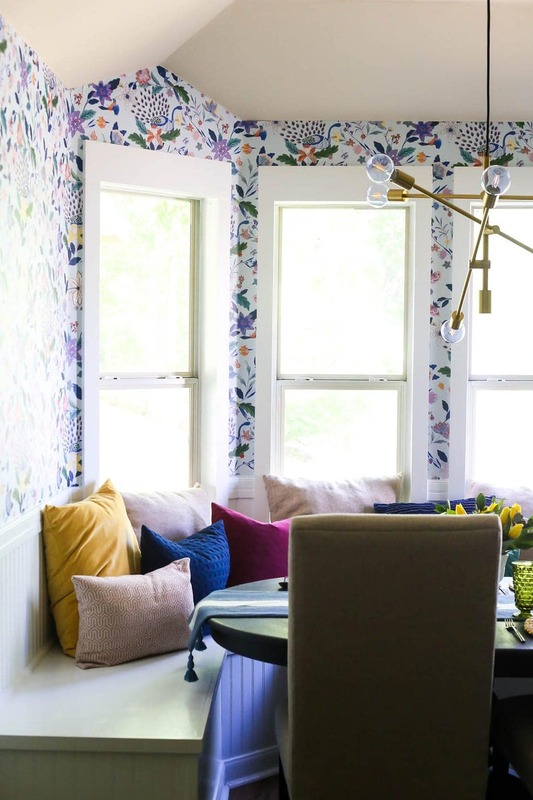 This particular wallpaper had quite a bit of wiggle room (I could move it around for a good two minutes or so before it started to become more difficult to adjust) so don’t stress too much – just try to get it lined up straight against the line on the wall. I typically left the bottom half of my wallpaper folded until I had the top part mostly smoothed out. Start by smoothing it with your hands just to get it in place, then grab your smoothing tool and gently press out any air bubbles or creases (use it at a 45-degree angle to the wall). This part of the process can get scary at first, but as long as your work slowly and patiently you’ll be fine. Don’t be afraid to pull the wallpaper slightly off the wall to re-adjust – you have a couple of minutes before it starts to fully adhere! Once you’ve go the wallpaper in place, grab your putty knife (you can use the wallpaper smoothing tool for this, but I preferred the thin edge of the putty knife) and gently press it into the crease at the ceiling. Run the utility knife along the edge of the knife to cut the wallpaper – continue along the length of the paper using the putty knife and utility knife to ensure a straight and clean edge. 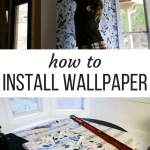 Do the same thing on the bottom of the wall, and you’ve officially installed your first piece of wallpaper! 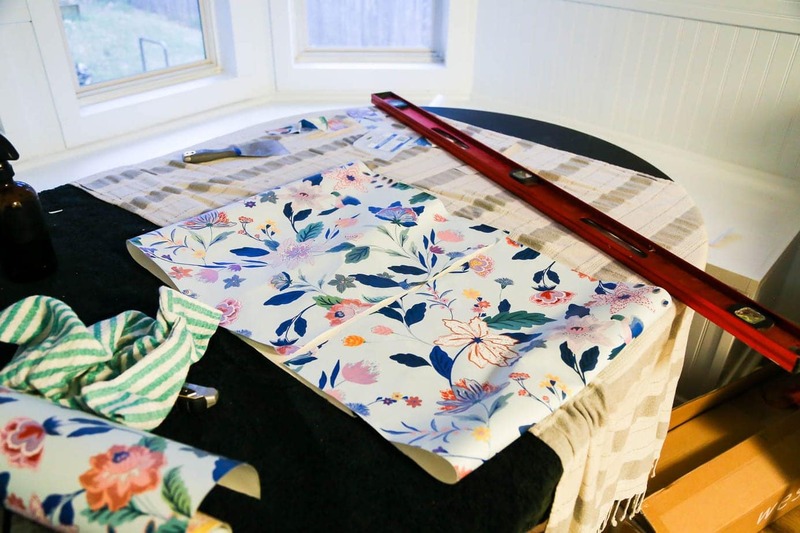 For the next piece, grab the entire roll and bring it over to the wall – you want to start by finding where the pattern lines up then measure from there. Generally, you’re going to end up wasting at least a few inches of wallpaper along the ceiling to ensure the pattern fits. It’s annoying, but it’s just how it goes. Once you’ve got your next length measured out, just repeat the process! Be sure that when you’re aligning your seams, you don’t overlap them and you also always slide the wallpaper into place. Try to start about 1/4″ away from where you need to be, then gently slide it until it butts up against the next piece. This gives you the cleanest seam and helps avoid peeling wallpaper down the line! Installing wallpaper around a window is tricky, but I feel like it’s kind of similar to wrapping a giant present. We installed trim around our windows before getting started on this specifically because we didn’t want to have to wallpaper the drywall inside of the window area. This made the process infinitely simpler (and looks pretty great, too). To install wallpaper around our window trim, I simply measured the piece of wallpaper as if it were a normal run and cut off the excess. On some parts, we actually were able to use leftover wallpaper scraps to piece together the smaller areas without creating more waste, but it wasn’t easy to find pieces that worked. For example, a couple of the windows consist of one larger piece along the top of the window plus a long skinny piece in-between the windows. 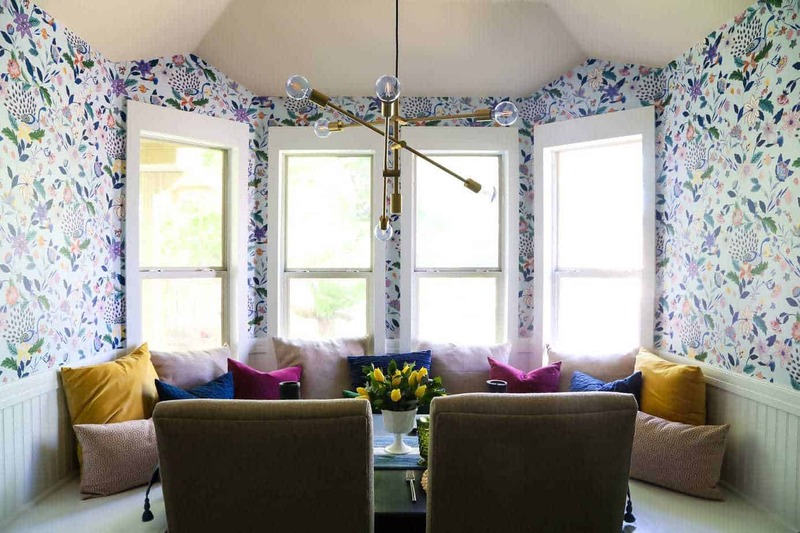 However, this isn’t possible until you’ve created a bit of waste (and even with the excess wallpaper, it may not be possible if the pattern doesn’t match), so for at least the first window you’ll need to measure as normal. I started at the top, smoothed out the wallpaper above the window and up to the top piece of trim. Then, I used my utility knife (paired with the putty knife!) to cut along the top of the window. At this point, you’ll have a lot of extra wallpaper flopping around, so I grabbed some scissors to cut diagonally up the window and removed a bit of the excess. Be very careful with this and cut far away from the side of the window – only cut off wallpaper you know you won’t need. Once at least some of the excess is gone, you can use the utility knife to cut along the side of the window, as you see in the image above. Repeat for the other side of the window, and you’re good to go! But what if I make a mistake?! It’s okay. It’s fine! To be completely honest, if you’re dealing with a highly-patterned wallpaper like this one, it’s unlikely anyone will even notice. I promise. On my first window, something went a little wonky (I’m still not sure what), and the piece along the top of the window ended up being slightly angled. As in, my wallpaper was no longer hanging perfectly straight. And you know what that means, right? All of the rest of my wallpaper has to line up perfectly with it, so of course now the rest of the room was going to be wonky. If I was working with a geometric pattern like stripes or something that mattered for it to be straight, I would have had to pull that piece down and start over. But with a more organic pattern like this, you can’t even tell that half of the room isn’t hung perfectly straight. You also can’t tell that where the wallpaper meets the tile in the image above, the bottom part of the wallpaper is patched with a strange triangular-shaped piece because (thanks to the not-so-straight hanging job), the top part of the wallpaper went all the way to the tile but the bottom part didn’t. You can’t tell unless you’re about two feet away from the wallpaper and looking for a seam. And even then, it just looks like a eam. Not like a mistake. So, rest easy and just give it a go. 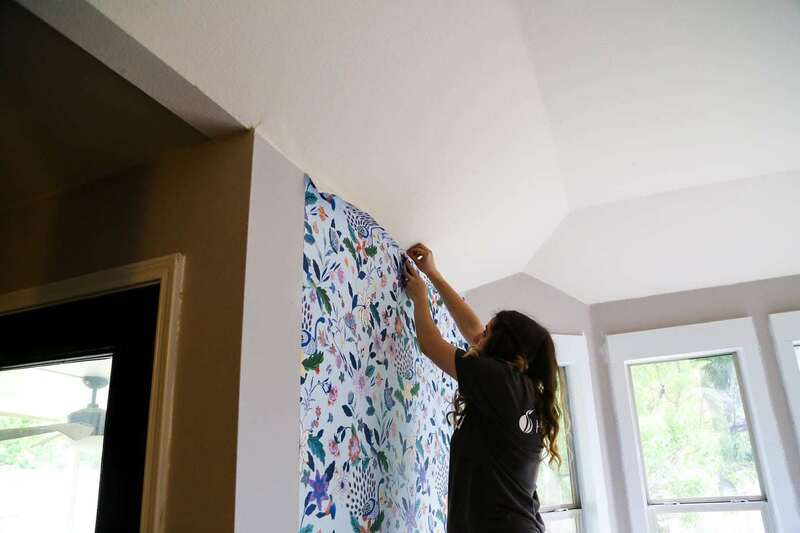 There are many little areas on this wallpapering job that I made mistakes but I can assure you I’m the only one who will be scrutinizing the room enough to even notice, much less care. What do you think about the Anthropologie wallpaper? I’ve had a soft spot in my heart for Anthropologie’s wallpaper ever since I fell in love with this closet that my friend, Kelly did years ago. Seriously – I’ve been thinking about Anthro’s wallpaper since 2014. We looked in a few other places first and chatted with a few brands about partnering for this project, but in the end, none of the opportunities really felt right and so we decided to go with a brand we felt confident we could trust. 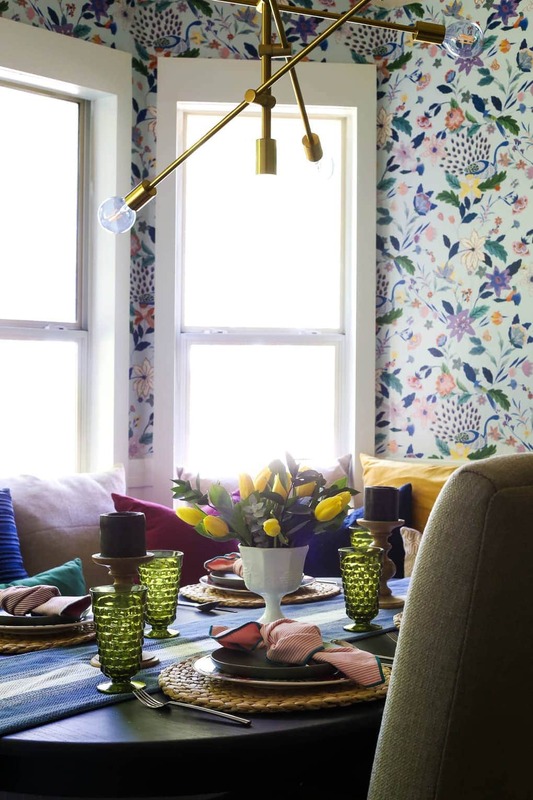 Anthropologie’s wallpaper is on the expensive side as far as wallpaper goes, but if you’re working with a smaller area it’s honestly not that bad. We caught a 20% off sale and spent just over $200 for the wallpaper in this space. As far as the quality of our Anthropologie wallpaper, I don’t have anything to compare it to but I was definitely pleased. It’s thick and has a very high-end feel to it, and the installation process was as easy as can be expected. I might be someone who has no other wallpaper experience (and therefore no real authority on the subject), but I can definitely say I’d use Anthropologie’s wallpaper again. They have a ton of gorgeous options, and the Sylvia wallpaper is really just about one of the prettiest things I’ve ever seen in my life. I hope that this post can give you a little bit of confidence if you’re thinking about installing wallpaper in your own home. It isn’t a simple project (at least, not if you’re installing with tons of corners and windows), and it requires a fair amount of patience, but I think it’s so worth the effort and I’m so glad we decided to take it on! 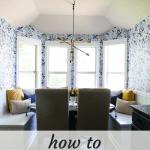 Have you ever wallpapered a room in your house before?! Obsessed with this! I cannot stop looking at it! Where did you get your light fixture? It’s so much fun! Thank you!!! 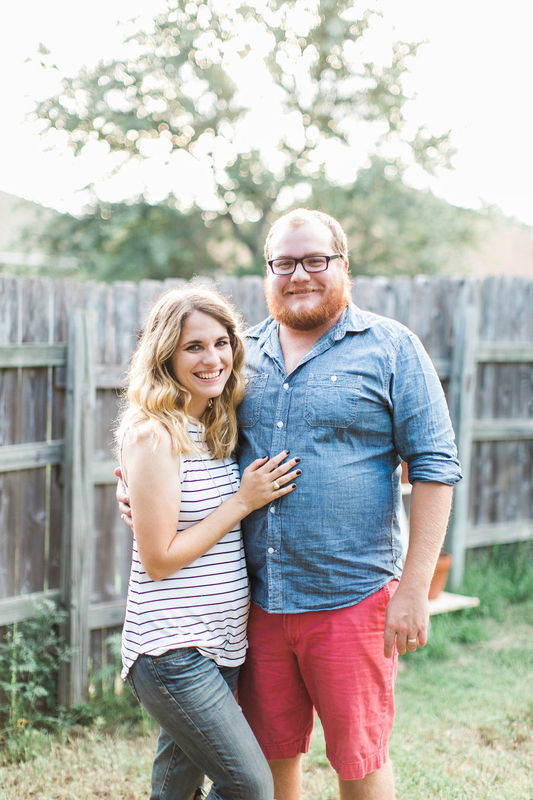 The light fixture is from West Elm – you can see it right here!